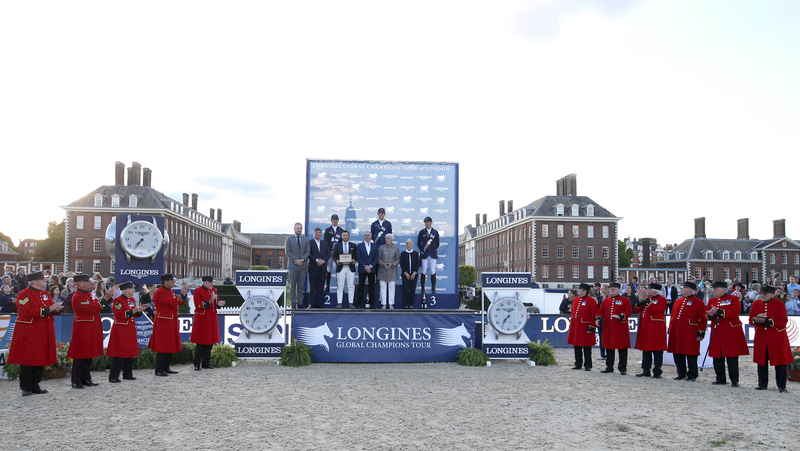 Eight out of the top ten riders in the Longines Global Champions Tour season rankings will take centre stage at the Royal Hospital Chelsea in London this week, for a three day festival of world class sport and thrilling entertainment. At the sharp end of the grid, home hero Ben Maher (GBR) leads the Championship on 237 points, the British Olympian securing an impressive two LGCT Grand Prix wins already this season. Maher won the London event in 2013, and was beaten by compatriot Scott Brash (GBR) by just three tenths of a second at this very venue in 2017 in an electric jump-off which had fans on the edge of their seats. Hungry for another LGCT Grand Prix win, and hoping for a boost from the home crowd, Maher will be one to watch this weekend as he looks to extend his championship lead and build on his dream of winning the 2018 Champion of Champions title. Just 22 points behind and also keen for another LGCT Grand Prix win to add to his collection of accolades is Longines World Number 1 Harrie Smolders (NED) on 215 points. The flying Dutchman will have one eye on Maher, but the other over his shoulder on Edwina Tops-Alexander (AUS) who sits in third and just three points away from Smolders with a tally of 212 heading into this weekend’s event. After his win in LGCT Berlin, Alberto Zorzi (ITA) has shot up to fourth in the overall rankings, where he now has a combined score of 202 points, and with Daniel Deusser (GER) in fifth, Christian Ahlmann (GER) in sixth, 7th placed Christian Kukuk (GER) and 9th placed Nicola Philippaerts (BEL) all heading to the British capital this week - and all within an LGCT Grand Prix win of each other - there could be a dramatic shake up in the rankings top ten. Saturday’s LGCT Grand Prix of London and GCL London final is almost sold out, but limited tickets are still available for Friday and Sunday where the world’s top athletes will meet head on for high-octane sport. The unique venue of the Royal Hospital Chelsea is the location for the world famous Chelsea Flower Show each year. World class show jumping will take place on the South Grounds which lead down to the River Thames with the breathtaking backdrop of the heritage buildings designed by Sir Christopher Wren. Founded by King Charles II over 300 years ago, it has provided care and comradeship for veterans, known the world over as the Chelsea Pensioners. As well as sporting action of the highest calibre, the event welcomes the majestic Household Cavalry Musical Ride, where the Queen’s Bodyguard will perform a breathtaking display of entertainment each evening for spectators and fans. A shopping village, kids entertainment and the exceptional backdrop of the Royal Hospital Chelsea will mean there is something for all the family at this very special leg of the Tour. The event attracts international show jumping names from around the world, including Eric Lamaze (CAN), Bertram Allen (IRL), Lorenzo de Luca (ITA), Laura Kraut (USA), Peder Fredricson (SWE), Ludger Beerbaum (GER), Simon Delestre (FRA), Cian O’Connor (IRL), Georgina Bloomberg (USA), Roger-Yves Bost (FRA), Maikel van der Vleuten (NED), Niels Bruynseels (BEL), Jennifer Gates (USA), Jerome Guery (BEL), Darragh Kenny (IRL), Denis Lynch (IRL) and Jessica Springsteen (USA) - just a few of those who will compete at the 13th leg of the Championship race. The UK has a strong equestrian community with millions of people riding and following the top British show jumpers as they compete around the world. As well as international stars, the best of the British will looking for a strong home turf result, with 2017 winner Scott Brash (GBR), John Whitaker (GBR), Michael Whitaker (GBR), Robert Whitaker (GBR), William Whitaker (GBR), William Funnel (GBR), Emily Moffitt (GBR), Alexandra Thornton (GBR), Amanda Derbyshire (GBR) and Harry Charles (GBR) all in action this weekend. The London event on the Longines Global Champions Tour calendar is the 13th event on the circuit, coming at a key stage in the 2018 season when the ranking battle will be at full throttle. So far this season 12 riders have qualified for the Longines Global Champions Tour Super Grand Prix - a prestigious competition which will take place at the all new GC Prague Playoffs. But who will join them, with a Grand Prix win ensuring a ticket to the Playoffs this December? Don’t miss a moment for this crucial leg of the Championship! For the full rider list, please click here.